This is the second part of a two-part article on how to knit with handspun yarn. For the first part, look here. Last time, I discussed the unique nature of handspun yarn, the different weight, density, and texture issues to take into account. In this post, I will be discussing plying and what makes handspun yarn so interesting to knit with. Click below. Number of plies. It's very important to know the number of plies you have in your handspun yarn. It's pretty easy to tell upon observation - Very rarely will handspun yarn have more than 4 plies, and usually it only has 2. A singles yarn is a yarn that has only one ply. Examples of singles yarns popular in the knitting community are the color-changing Noro yarns and Malabrigo worsted. Rather than looking like a rope with many plies twisted together, these are a single strand. Most commercial yarns will have many plies, at least 6 if not more. 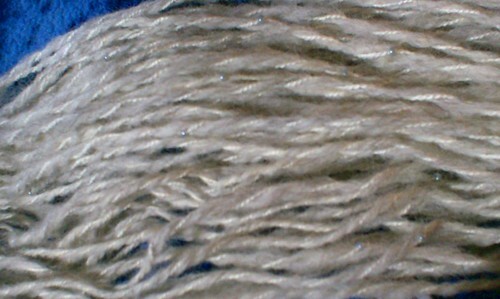 Singles yarns are common in handspun because they're easy to spin. Think about it: for a 2-ply yarn, you have to spin twice as much yardage and almost half as thin. Singles yarns are pretty instant gratification, and they're also good for showing off small amounts of fiber. 40 yards of silk yarn won't do much on its own - But 80 yards of yarn could be a neckwarmer, hat, or small pair of fingerless gloves. However, singles yarns are weaker than plied yarns, since there's only one strand to take all the abuse. They also have more of a tendency to shed, and if they keep shedding they might fall apart altogether. They exhibit more thick-and-thin characteristics, since plying tends to even out your yarn. Also, unless the yarn is nearly balanced (which means it is very loosely spun, which means there's a greater chance of breakage), they have the tendency to bias, which means they will put a twist to your knitting. Some people use this to their advantage, but usually it just messes with the gauge and shape of your fabric. Knitting with handspun yarn is VERY rewarding. If you spin it yourself, there is little that can make you prouder than taking some fluff and turning it into something you can wear. This is a pair of socks that I dyed, spun, and knit. 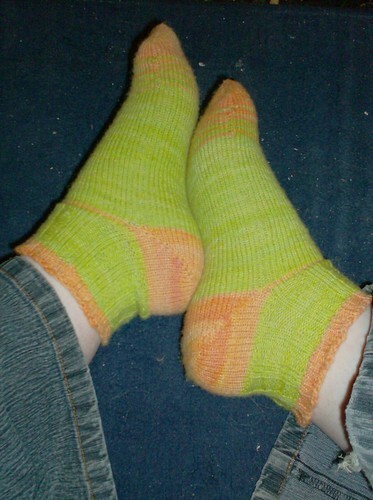 I went from some plain white wool top, and now I have bright orange and green socks. I take a lot of pride in that. Even if you don't spin it yourself, there's a lot to be said for the unique experience of knitting with handspun yarn. With handspun yarn, you can achieve results that would be more difficult or impossible with commercial yarns - for instance, long striping color changes are very easy to achieve when spinning from dyed roving, but much harder to do if you dye the yarn after it has been spun. Handspun yarn is to commercial yarn as a handknit sweater is to one from a store: You can customize it however you want. Whatever color, texture, thickness, fiber content, it's all up to you, and you can spin up some things that you wouldn't necessarily find in an LYS. Beads, colors, slubs, color changes, fiber changes, reinforcing thread, you can spin anything you like into your yarn. You can find really creative spinners out there who make yarns you'd never dream of. The possibilities are endless, and that's why I love to spin. How would you incorporate bias into fabric construction? Panels that counter eachother? Oh the geometry hurts my head. Link me? On this site: http://www.fuzzygalore.biz/patterns/zigzag.shtml They show some examples of using energized singles. The scarf at the top is alternately spun S-twist and Z-twist, which gives it that zigzag look. I also saw a small knitted cuff in Spin-Off magazine that used energized singles and gave it a twisting spiral look. very very cool, what an acomplishment. I hope to someday make my own hand spun, hand dyed, hand made socks!! Great post. I have a much better understanding of handspun now. I've always loved working with it but I know understand more why it can be challenging at times. those orange socks are adorable.